I set up my personal training studio in 1999 so that I could offer a reliable, flexible service in the privacy of my own facilities. My gym is well equipped for cardio-vascular and resistance exercise. I have equipment to help you develop balance, co-ordination, and core stability. I also have two changing rooms, each with a shower, shampoo and shower gel. When you contact me regarding personal training, I will answer any immediate questions you may have, but I will also always offer you a free, no-obligation 30-minute consultation. This gives you a chance to discuss your needs in detail, ask plenty of questions, view my facilities, and make a more informed decision on whether you would like to have personal training sessions with me. If you wish to go ahead, our first session will be based on the information that we have discussed during your consultation. I will guide you through every session, helping you to achieve as much as possible in the allotted time. Your goals will always form the main focus of your sessions, however each session will be differently composed because you will gain more, both physically and psychologically, from varied workouts. I will also adjust your exercise programme according to how you feel on the day. 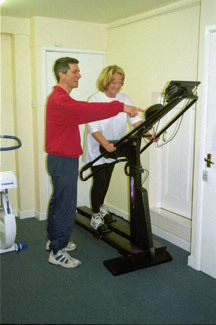 For example, if you are experiencing a particularly pressurised period at work, where your concentration and mental clarity need to be in top form, then your workouts need to provide you with a stimulus that allows you to mentally relax and helps you with a physical balance that does not leave you feeling exhausted. Of course, we do not have to use my gym for all your exercise sessions. I am based literally a few seconds away from the Downs which offer a great site for training outside. My sporting background is in competitive swimming and I have helped clients with their swimming technique and fitness at local pools. If you are a member of a gym then it may be possible for me to get permission to train you there. Finally, if you would prefer to exercise at home then I am very happy to help you to do this, either via home visits or through remote training. I believe that exercise is an invaluable tool that can help you in so many different ways. If you take a positive step by contacting me, then I will do my best for you, to help you achieve all the benefits possible. 4 Rockleaze Road, Sneyd Park, Bristol BS9 1NF, UK.